The International Space Station will be a permanent laboratory for human-monitored long term research in the unique environment of Earth-orbital space, an environment that cannot be duplicated on Earth for long duration experiments. Research at the station will focus on two key areas: life sciences and materials sciences. Life science research is expected to lead to a clearer understanding of basic processes to provide a foundation for development of advanced medications for improved human health care. Material research offers promise of improved metals, composites and plastics for significant advances in technologies for communications, transportation and a broad range of industrial processing operations. Completed early in 1996 was the Boeing-built structure for the U.S. Laboratory Module, a key element of the International Space Station. The aluminum module is 28 feet long and weighs three tons. 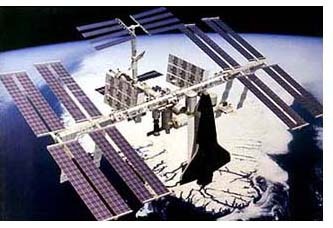 The International Space Station draws upon the resources and scientific/technological expertise of 13 cooperating nations, including the U.S., Canada, Japan, Russia and nine nations of the European Space Agency (Belgium, Denmark, France, Germany, Italy, Norway, Spain, The Netherlands and the United Kingdom). The prime contractor is The Boeing Company and the principal subcontractors are McDonnell Douglas Corporation and the Rocketdyne Division of Rockwell International. While the Phase I flight program was under way in 1995/96, manufacturers were turning out the first hardware components of the space station. Among major segments completed in 1995 were two Boeing-built nodes (Node 1 and Node 2). The nodes will serve as connecting passageways between modules. Node 1 will be the first U.S.-built hardware delivered to orbit. 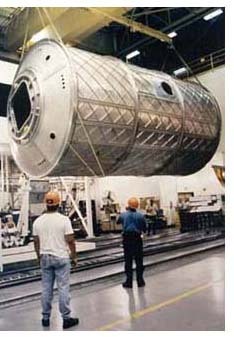 Also built by Boeing is the structure for the U.S. laboratory module where astronauts will perform continuous scientific research; it was delivered early in 1996. 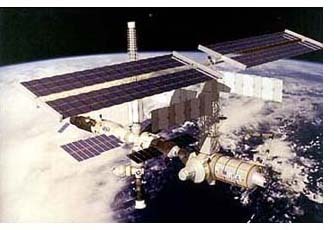 Phase II of the space station program, construction in orbit, begins in November 1997 with the launch on a Russian Proton vehicle of the FGB functional cargo block. The FGB is a 21-ton element, built in Russia but purchased by the U.S., that will provide attitude control and propulsion during the early assembly operations, plus solar power and berthing ports for additional modules. The interim International Space Station will look like this. In the right foreground is the U.S. Laboratory Module and the station's airlock. In the center of the horizontal string of modules is the FGB energy block. The solar power array at top is one of four that will provide power for the complete station. Below the tower is the Russian-built Universal Docking Module and, at bottom, one of two crew transfer vehicles. A month later, Node 1 will be delivered by the Space Shuttle and attached to the FGB. In May 1998, the embryo space station will grow with the addition of the Proton-boosted Russian Service Module, which provides life support and habitation facilities, utilities and thrusters. Shortly thereafter, in May 1998, the crew transfer vehicle-a Russian Soyuz TM capsule-will be joined to the station. In June 1998, the first three-person crew will begin its orbital stay. Further additions to the expanding station in the latter part of 1998 and early 1999 will include one of the four U.S. solar array modules, which will provide about 23 kilowatts of power; segments of the central truss; the U.S. Laboratory Module; the Canadian-built mobile servicing system; the Russian Universal Docking Module; and the equipment for outfitting the U.S. Laboratory Module. With Shuttle delivery and attachment of an airlock in the spring of 1999, Phase II officially comes to a close. In Phase III, the International Space Station will progress gradually to its ultimate status as a fully operational permanent orbital research facility. Among key additions to the core configuration are the remaining modules of the U.S.-built solar array; the Japanese Experiment Module (JEM), to be delivered in 2000; and the U.S. habitation module (February 2002), which contains the galley, toilet, shower, sleep stations and medical facilities. A view of the International Space Station in its final configuration with a Space Shuttle Orbiter docked at the fore port. The cylinder near the Orbiter's nose is the U.S. Centrifuge Accommodation Module. Below it, hidden by the Orbiter, is the U.S. lab module, flanked by the European (left) and Japanese laboratories. 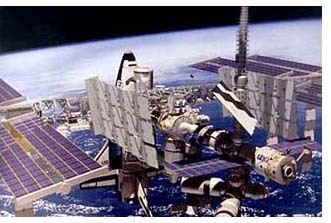 With the delivery of a second Russian crew transfer vehicle in June 2002, the station will be virtually complete (the European Space Agency (ESA) laboratory, known as the Columbus Orbital Facility, will be joined to the station early in 2003). At that point, the station will have a full six-person crew capability. The completed station will measure 361 feet from tip to tip of the solar arrays. That corresponds to the length of a football field with both end zones included. However, the area of the station complex is equal to that of two football fields. The pressurized living and working space is roughly equivalent to the passenger cabin volume of two Boeing 747 jetliners. The atmospheric pressure within the pressurized modules will be 14.7 pounds per square inch, same as on Earth's surface. There will be seven laboratories. The U.S. is providing two of them, the basic laboratory module and a special Centrifuge Accommodation Module. There will be three Russian research modules, the Japanese JEM and ESA's Columbus module. The U.S., ESA and Japanese laboratories together provide 33 International Standard Payload Racks; additional payload capability will be available in the Russian modules. In addition, the JEM has an exposed "back porch" with 10 mounting spaces for experiments that require long duration contact with the space environment; the JEM has a small robotic arm for moving back porch payloads. This concept views the station from the opposite (aft port) end. In the foreground (lower right) is the Russian Service Module, with living and working room for three crew members. Next, toward center of photo, is the FGB energy block, then (near the Orbiter) the U.S. lab module. The vertically-mounted cylinder below it is the U.S. habitation module. A central girder connecting the various modules and the main solar power array is the U.S.-built integrated truss. Moving along the truss for robotic assembly and maintenance operations is the Canadian-built Remote Manipulator System with its 55-foot robot arm and mobile transporter. The four modules of the solar array, generating a combined 92 kilowatts of power, rotate on the truss to maximize their exposure to the Sun. The International Space Station will operate at an average altitude of 220 miles. At that altitude, minute drag forces will cause the station to lose height very gradually, so it will be necessary to reboost it every 90 days. The reboosting will be accomplished by the FGB. Beginning with the 1997 launches of the Russian Proton and the Space Shuttle, there will be 73 assembly and service flights until the station becomes fully operational in midyear 2002. The Space Shuttle will make 27 trips, 21 for assembly operations and six for utilization/outfitting. The Russian Proton and Progress and Ukrainian Zenit launch vehicles will make 45 flights; 15 of them will be made by the Progress vehicle, bringing up propellant for the reboost work.